You are here: Home / Blog / Breads / Irish Soda Bread – Happy St. Patty’s Day! 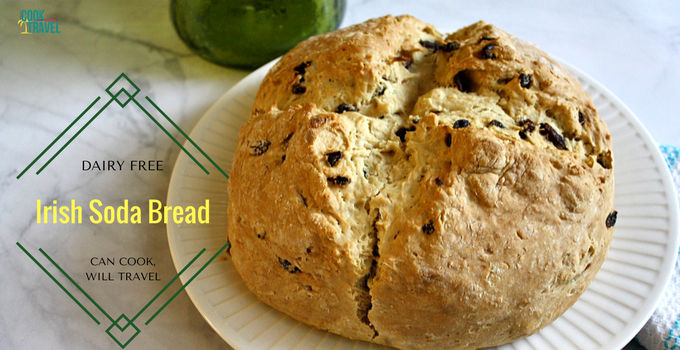 Irish Soda Bread – Happy St. Patty’s Day! Happy almost St. Patty’s Day! Who doesn’t love this holiday? It’s one of my favorites for just going out and having a great time with friends. And when I’m not out on St. Patty’s Day, then the Irish part of me says I need to eat well. Of course I do love corned beef and cabbage to celebrate, but I’ve been wanting to make Irish Soda Bread on my blog for ages. Truthfully, I thought I’d made it years ago, but upon searching for it I was shocked to find that I never actually baked it on here. Well it was time to right that wrong, and since I’m cooking dairy free as much as possible these days, I was on a mission to figure out how to bake a dairy free version. Now traditional Irish Soda Bread calls for butter and buttermilk, which are the definition of dairy. However I was looking forward to trying to create a new version that would work for me. It actually was extremely easy. For the butter substitute, I went with a vegan butter alternative. I weighed out my butter and then popped it in the freezer so it stayed nice and cold. And then I made my own dairy free version of buttermilk, which was a cinch. Just add some apple cider vinegar to almond milk (or whatever nut milk you’re using), and then let it sit for a bit so that it can start to bubble, which is totally normal. Aside from that, it’s a pretty standard recipe that reminded me of making scones. Just combine your dry ingredients and then add the butter and use your hands to work the butter into the flour. Then mix in your wet ingredients and form it into a ball. Irish Soda Bread can contain raisins if you want, and I thought it’d be fun to add the raisins in for a bit of color and also a slight sweetness. I loved it with the raisins in there, but it’s totally up to you. 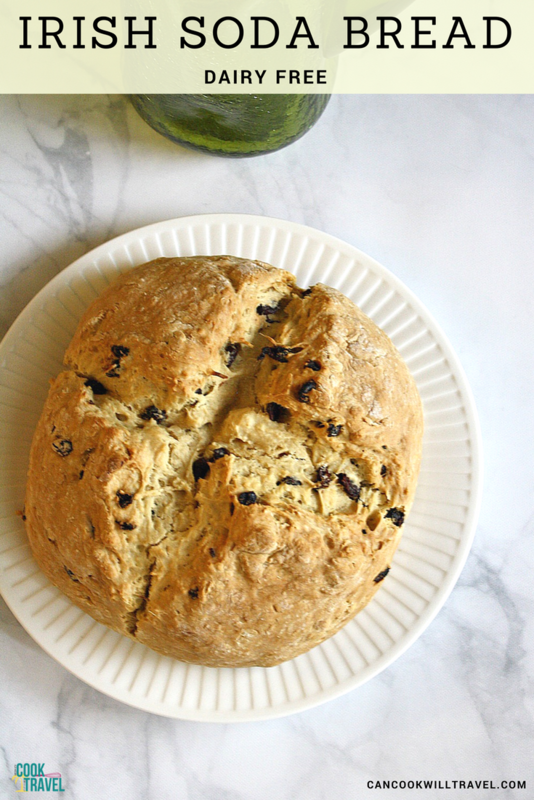 I have to say this Irish Soda Bread is a perfect addition to your St. Patrick’s Day meal. You get this great crust that forms on the outside, yet it’s still tender and moist on the inside. And the bread baked so well despite my dairy substitutions, which was awesome! I cannot wait for you to whip up this recipe. 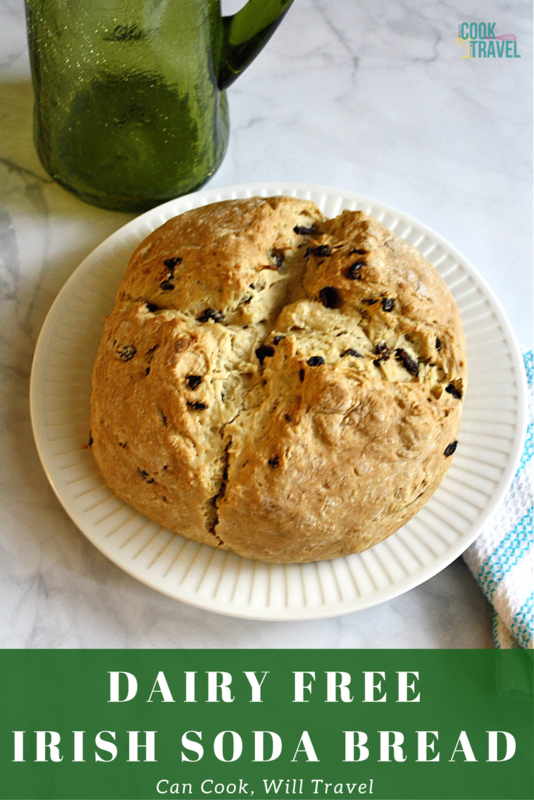 Get ready to have a stellar St. Patrick’s Day dinner with this dairy free Irish Soda Bread. Click that link for the recipe and step by step instructions. Happy baking! One year ago: Coconut Crusted Chicken Strips = One Sweet Dinner! Three years ago: Warming Slimdown Soup = Guilt-free Soup for Me! Four years ago: Shrimp & Grits . . . Why Not?! Six years ago: Fish Tacos . . . Uh, Yes Please!